Registered Apprenticeship is an employer-driven model that combines on-the-job learning with related classroom instruction to increase skill level and economic mobility. Apprenticeships are a proven solution for companies to recruit, train, and retain highly skilled workers—and it is a way to put employees on a career path that will encourage them to stay and advance in hospitality-sector jobs. National Restaurant Association Educational Foundation and the American Hotel and Lodging Association have approved and registered apprenticeship standards with the US Department of Labor that are ready to go! Meeting the demand. A competitive workforce requires training models that work.  Apprenticeships are a powerful solution that equip workers with the skills needed to drive the success of your business. If you face challenges in attracting and retaining the skilled workers you need, the Hospitality Sector Registered Apprenticeship project can be your answer. National Restaurant Association Educational Foundation (NRAEF) and the American Hotel & Lodging Association (AHLA) and are working with lodging and restaurant employers to expand HSRA with employers to benefit with a more skilled, diverse, and competitive workforce. What's Registered Apprenticeship? It's a proven system of workforce training that allows employers to "grow their own" workers, while helping employees learn the skills to be successful on the job. It typically includes a mix of on-the-job training and related technical instruction, providing positive results for workers and employers. Benefits. Apprenticeship provide a framework for building a pipeline of skilled employees. Companies report higher productivity, retention rates, and a substantial return on investment. Finding and retaining the right talent is tough. The American Hotel & Lodging Association (AHLA) and National Restaurant Association Educational Foundation (NRAEF) have come together to provide training and support for employers to benefit with a more skilled, diverse and competitive workforce, reduced turnover costs, and higher productivity. Employers are often competing for talent or dealing with turnover. Apprenticeship is a proven model for retention, and a way to stand out from the crowd—a Registered Apprenticeship program means your training initiatives have been thoroughly vetted, making your company more desirable to be a part of as a high-quality expert in the industry. Develop your next generation of leaders using a nationally approved training model created by industry, for industry. Through the Workforce Innovation Opportunity Act (WIOA), local workforce boards across the country can help to fund the wages, training, and development of your employees through apprenticeship. NRAEF & AHLA are well-connected to resources and expertise that can help you successfully customize your program to align with national industry standards. Connect with a national network of expertise, customer service, and support at no charge. A good way to attract a loyal, high-quality workforce is to offer credentials. Graduates of Registered Apprenticeship programs receive a national, industry-recognized credential. Apprenticeship programs pay for themselves through reduced turnover, resulting in lower training costs and higher profitability. As part of the work led by NRAEF and AHLA, companies will be able to navigate and promote apprenticeship as an industry initiative. A registered apprenticeship means the program has met national and independent standards for quality and rigor. Registration tells prospective employees, customers, and suppliers that you invest in your workforce and that you believe your employees are your most important asset. Companies and apprentices can access funding and other resources to help support their Registered Apprenticeship programs, including tax credits, programs for veterans, and financial aid. Our high-quality, free assistance includes providing planning support, recruitment advising, access to training materials, and marketing and promotional opportunities—with resources available online whenever you need it. If the answer is "yes" to any of these questions, then apprenticeship is the right strategy to meet your needs for skilled and committed hospitality workers. Together, we can help define and validate the skills needed to make us productive and competitive in a growing industry that can provide opportunity for all. NRAEF and AHLA will work closely with you to make sure your apprenticeship gives you the results you're looking for. For more information on restaurant apprenticeship, email John Shortt, jshortt@nraef.org. For more information on lodging apprenticeship, email Shelly Weir, sweir@ahla.com. ©2017 National Restaurant Association Educational Foundation and National Hotel & Lodging Association . All rights reserved.